Launched: 31 July 2011. Last updated: 17 April 2012. Japan has the tradition of recognizing "national living treasures," people who have reached a level of expertise and accomplishment high above most others. The Antarctic Circle would like to emulate this form of recognition. In 1948 moved from Christchurch to Oamaru on the east coast of New Zealand's South Island. Here became aware of the link with the Terra Nova and message sent advising the death of Scott and his men. Mother's father attended Scott's lecture in Wellington October1910 and as a member of the Philosophical Society and Masonic Lodge, met Shackleton at his lecture in Christchurch 1917. In 1958 owing to father's employment, returned to Christchurch and lived next door to last private secretary of Sir Joseph Kinsey (and friend of his daughter) the agent for Scott's and Shackleton's expeditions. Became immersed in activities of Operation Deep Freeze and various officers including Admiral George Dufek and other officers, visited home and gave souvenirs. While a laboratory and field technician at Canterbury University, made first visit south as a field assistant with Dr Bob Kirk and worked at Cape Bird on Ross Island in 1974-75. Took up a new position of Assistant Curator (later Curator, then Archivist) Antarctic collections at Canterbury Museum when many significant objects were located and enhanced the now world-renowned collection. As a member of the RDRC Historic Sites Management Committee assisted in establishing the Antarctic Heritage Trust (1987). A year was spent with the Government's agency NZ Antarctic Research Programme (NZARP) writing educational leaflets then moved to Christchurch International Airport Ltd to undertake research for the International Antarctic Centre public visitor center. Established South Latitude Research Ltd in 1996. Has included numerous visits associated with historic hut preservation on Ross Island and at Cape Adare (three expeditions); as geomorphologist and field technician with ANARE in the Larsemann Hills. More recently shore guide and lecturer on cruise ships to Ross Sea; Antarctic Peninsula and Commonwealth Bay. Over 160 peer-reviewed papers; books and popular articles. Last book, Call of the Ice, commemorated 50 years of New Zealand in Antarctica. Most recent academic paper compiled over last four years, is now with Cambridge University Press and due in a forthcoming issue of Polar Record. Conservation Award NZ Antarctic Society (1987); BSc (1993); Winston Churchill Memorial Trust Fellowship (1996); DSc (2009) for original Antarctic research (wind at Cape Adare); New Zealand Antarctic Medal (2010). Numerous memberships of societies including New Zealand Antarctic Society (over 35 years); NZ Archaeological Association (over 50 years) and involvement with other societies such as Explorers' Club (New York) and Trans Antarctic Association (Hillary Hut Committee-Scott Base). 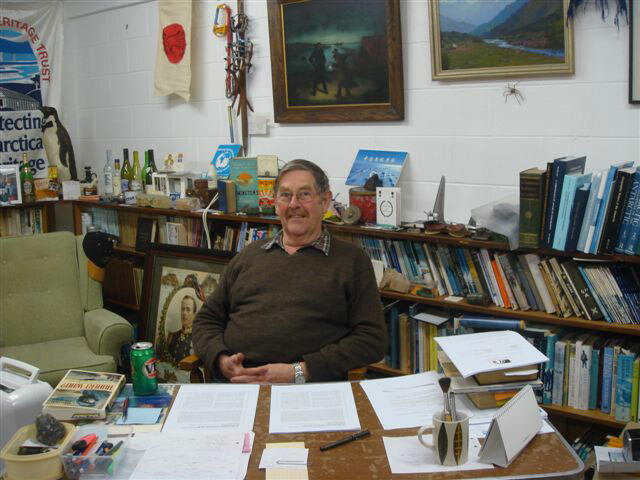 With fiancee Zena (she has enjoyed visits to the Antarctic Peninsula and South Georgia) has retired in Oamaru and established his third Polar Room as a place to welcome and enjoy convivial moments with passing "explorers". Busy assisting students of Gateway Antarctica in Christchurch, the editor for next book, a history of New Zealand mountaineering, completing the draft for a book on Oamaru and Antarctica and assisting with the proposed 2013 commemoration of the Terra Nova visit to Oamaru. Polar related interests include books (non-electronic of course); extensive personal archive; historical archaeology; Canterbury and North Otago Museums and work of the NZ Antarctic Society, the AHT, Scott Polar Research Institute Cambridge and maintaining contact with polar colleagues. David Harrowfield in his Polar Room. Educated at Thistley Hough Grammar School for Girls, Stoke-on-Trent, at Royal Holloway College, London University (B.A. Hons. in History), at Burslem School of Art and at the Sorbonne. First post in the University of Aberdeen (King's College Library); then for twelve years (1954-66) on the staff of the Scott Polar Research Institute, University of Cambridge. This period included a year's sabbatical leave in Australasia working on a catalogue of polar and whaling mss, (S.P.R.I. mimeographed, 1963). Travelled outwards via the Suez Canal in the liner Arcadia (P&O) and home via Panama, the latter a nine week voyage in MV Mélanésien, a cargo and passenger vessel owned by Messageries Maritimes, Marseilles, calling at the French Pacific islands. Joined the National Maritime Museum, Greenwich, as Assistant Keeper (Manuscripts) in 1970. Custodian of Mss. 1973-77. Responsible for the Arctic Gallery; also Research and Displays Officer for "Project Discovery" after the vessel's handover by the Royal Navy to the Maritime Trust, ca.1984. Retired 1987. Lecture and consulting tour of Australia, sponsored by British Council, 1989. Edited The Discovery diary of Edward Wilson, 1901-04 (London and New York, 1966), and Scott's last voyage (London, New York and Amsterdam, 1974). Author of The Search for the North West Passage (London, Chatham Publishing, and New York, St. Martin's Press, 1999). "Biography" of Captain Scott's ship Discovery (now in Dundee), published September 1992 by Virgin Books, London under the title The Voyages of the "Discovery". This merited a "Best Book of the Sea" award and was reprinted in "limpback," August 1994 and subsequently. On the vessel's centenary in 2001, an abridged edition was published by Chatham Publishing in London and New York. With H.G.R. King, edited Polar Pundit (Cambridge, 1995), a book of reminiscences about Dr. Brian Roberts, C.M.G. Biographical essay on Sir Clements Markham, F.R.G.S. (1830-1916) published in the 150th anniversary volume of the Hakluyt Society Encompassing the great globe of the Earth, edited by R.C. Bridges ard P.E.H. Hair, 1996. Another, well illustrated, article on Markham was published in History Today, March 2001. Member of ARTAF (the Archival Research Task Force), United Kingdom of the Meta Incognita Project in Canada, researching aspects of Sir Martin Frobisher's Arctic voyages, 1576-78, published by the Canadian Museum of Civilisation in 1999. Contributor to the Oxford Dictionary of National Biography as well as to sundry encyclopaedias and to the Polar Record, Geographical Journal, Mariner's Mirror, etc. Delivered the Annual Lecture to the Hakluyt Society in 1986 on "Discovering the Discovery" (published 1987) and the Annual Lecture 2002 on "The North West Passage in the 19th Century: perils and pastimes of a winter in the ice," published by the Society the following year. After ten years' work off and on, the fourth volume of The South Polar Times, Midwinter 1912, was published In facsimile by the Scott Polar Research Institute, Cambridge and J. and S.L. Bonham, London, in a collectors' edition of 500 copies at £250-£275 each in 2010. Beautifully designed by Vera Brice, the Introduction, extensive commentary and biographical notes on the contributors are by Ann Savours. The original had been edited in the Antarctic at Cape Evans, Ross Island, by Apsley Cherry-Garrard in 1912, but was not reproduced in London (unlike the earlier volumes) on the return of Captain Scott's Terra Nova expedition 1910-13. The same year, Ann Savours contributed the lead article in Northward Ho! A Voyage towards the North Pole 1773, the book of the exhibition held in the Captain Cook Memorial Museum, Whitby, about the naval scientific and exploring voyage, commanded by the Hon. Captain Constantine John Phipps in H.M. Ships Racehorse and Carcass,1773. Member, as a guinea pig, of the Cambridge Physiological expedition 1955 to Spltsbergen. Sailed to Macquarie Island in the Southern Ocean in Magga Dan as assistant algologist with A.N.A.RE (Australian National Antarctic Research Expeditions), 1960. Crossed Lapland by reindeer sledge with a Lapp (Same) 1954. Visited Churchill and York Factory on Hudson Bay with the Centre for Rupert's Land Studies (University of Winnipeg) c. 1988. Lecturer during voyage to North Pole in Russian nuclear icebreaker, Yamal, August 2001. Longstanding member of the National Trust and the Royal Geographical Society. Member of R.G.S. Council, 1978-80. Received the Murchison Award from the Royal Geographical Society, June 2001. Liaised between the Gographical Club and the Librarian, Map Curator and Archivist of the R.G.S. in the provision of grants by the Club for the repair and conservation of items in their care, a scheme which she initiated a decade ago. Member of Council of the Hakluyt Society (founded 1846) at intervals 1980 to present. Elected a Vice President 2002-06. For the past ten years, she "shepherded" the annual lectures set up fifty years ago in honour of Professor E.G.R. Taylor, between the sponsoring societies—the R.G.S., the Society for Nautical Research, the Royal Institute of Navigation and the Hakluyt Society. Sometime Honorary Research Fellow, Australian National University, Canberra and Exhibitioner, Royal Holloway College, University of London. Hon. Secretary of the Society for Nautical Research, January 1988 to December 1990 and member of Council at intervals, 1991-2000. Cruised up the west coast of Greenland, summer 2004, and had the joy of visiting one of hte Viking churches. Initiated the conference, held after the hand-over of Hong Kong, at the Merseyside Maritime Museum, with the Society for Nautical Research, on "British Ships in China Seas," which resulted in a book with the same title, edited by Richard Harding, et al. published in 2004. Hon. Member, Eliot College and Hon. D. Litt. University of Kent at Canterbury. Lecturer and occasional outside examiner for M. Phil in Polar Studies, University of Cambridge, 1989 to 1998. Married Laurence Shirley (met on the MV Mélanésien voyage noted above) in November 1961, who died in January 2003. Sons John and Nicholas born 1962 and 1966, respectively. Six grandchildren. —Prepared by Ann Savours Shirley, May 2011. Ann and her dog Liffey at home in Bridge, Kent, May 2011.